Relax and enjoy breathable fresh air. The built in dust, odour, temperature and humidity sensor will do all the hard work for you. When the sensor recognises a change in the air, the Clean Sign will change colour from green to yellow or red dependng on the serverity of the change. 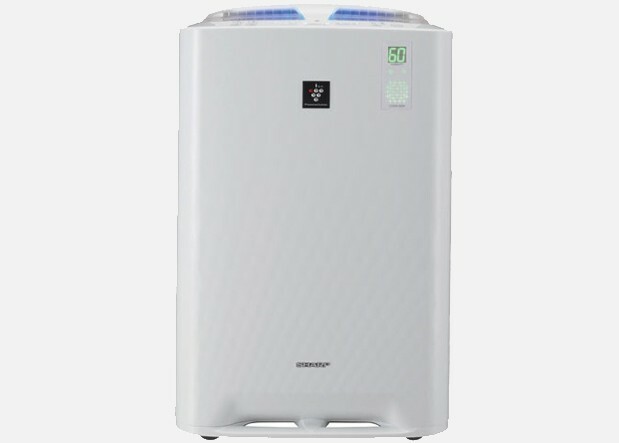 When dust or other airborne particles are detected, the air purifier will increase the fan speed to capture and reduce any airborne substances. When humidity is detected below 40% moisture will be added to the air until the ideal level of humidity between 40-60% is reached. The long collection nozzle based on aerodynamics provides a faster and more efficient air flow. In addition, the Plasmacluster didpersion directs airflow backwards at a 20-degree angle as well as forwards for rapid air purification. This delivers up to 1.5 times higher density of Plasmacluster ions when dispersed into a room for 60 minutes enabling quick removal. The aerodynamic structure quickly collects dust and other particles from low parts of the room. The HEPA filter helps to remove common household allergens such as dust, pollen, pet dander and smoke from the air. The Sharp HEPA filter catures 99.97% of these particles as small as 0.3 microns. The deodoriser pre-filter is to prevent larger dust and dirt particles reaching the HEPA filter and capture any odours drawn through the filter system. By using both passive and active purification methods, the air is being filtered more effectively and efficiently. The Passive method is based on the HEPA, deodoriser and pre-filter filtration systems. Air is drawn into the system for the filters to capture substances from the air. The Active method cleanses the air by releasing positive and negative ions throughout the room reducing and deactivating airborne substances using Sharp's patent Plasmacluser Ion technology.